Two men have been cleared of deadly skin cancer using genetically modified versions of their own immune cells. 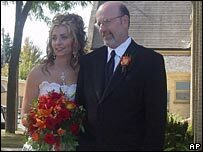 For Mark Origer, 53, the treatment destroyed his tumour, enabling him to attend his daughter's wedding. The US National Cancer Institute team in Bethesda has also shown it can manipulate immune cells to attack breast, liver and lung cancers. The modified T cells persisted in 15 other patients treated, but their malignant melanomas remained. Before the experiment, the patients were expected to only live for three to six months because their disease was so advanced. Tests showed the genetically modified T cells used in the new treatment became specialised tumour fighters, the journal Science reports. Although only two of the 17 people with advanced melanoma who received the treatment were completely free of cancer 18 months later, experts say the results are extremely exciting and proof that this new therapy can work. Dr Stephen Rosenberg and his team isolated T cells from the cancer patients and multiplied them in the lab. 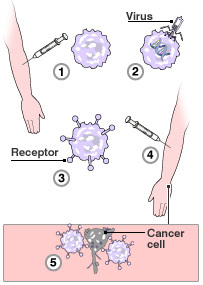 Next they used a virus to carry receptor genes into the T cells. These receptors are what enable the modified T cell to recognise specific cancers - in this case malignant melanoma. When the modified T cells were transfused into the patients they began to attack the tumour cells. For at least two months after the treatment, the modified cells made up at least 10% of the patients' circulating T cells. The scientists are now looking at ways to enable greater numbers of the modified T cells to survive. Dr Rosenberg said: "We've identified T cell receptors that will now recognise common cancers." For Mark Origer, 53, the treatment completely eliminated his skin cancer and another tumour on his liver shrunk enough that it could be removed surgically. The treatment meant he was well enough to attend his daughter's wedding last year. Last week, doctors pronounced him completely clear of cancer cells. Another man, aged 39, was able to clear the cancer that had spread to his liver, lymph nodes and lung. Dr Michael Sadelain, director of the Memorial Sloan-Kettering Cancer Centre's somatic cell engineering laboratory, said: "This certainly is a significant technical advance." But he said the technique would need improving so more patients could benefit. Professor Savio Woo, from Mount Sinai School of Medicine, said the treatment should now be tested in more patients. Professor Robert Hawkins, professor in medical oncology at the University of Manchester, UK, said the results were very exciting. "It seems to be effective, but it does seem to need improvement," he added. Dr Edel O'Toole, consultant dermatologist at the Centre for Cutaneous Research, Barts, and British Skin Foundation spokesman, said: "I think that the success of this approach in two patients shows promise, however 15 patients did not respond to the treatment suggesting that further work is needed to optimise this approach for all patients, which could take many years." Professor John Toy, medical director at Cancer Research UK, said: "These are preliminary but promising results. "It's important to realise that we are not looking at a 'miracle cure' for all cancers." Malignant melanoma is the most serious type of skin cancer with 8,000 new cases per year in the UK and approximately 1,800 deaths.